If WiFi fails, your ajax call fails and your backup re-submit code fails, you may need a last ditch solution of physically grabbing your form data from inside your PhoneGap app, off of an individual iOS device. Make sure the app is coded to save data locally using HTML5 localStorage API. 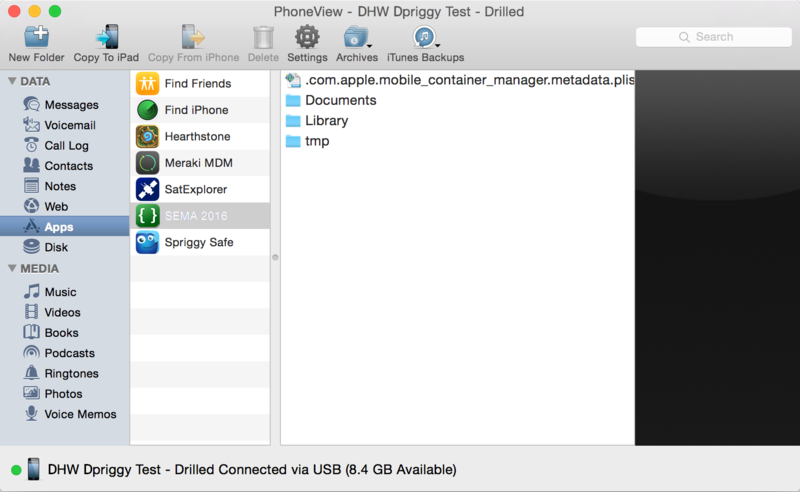 Once the localStorage functionality is tested and working, and you have your PhoneGamp / cordova app running on an iPad, you can use PhoneView to access the file system on your the iPad. 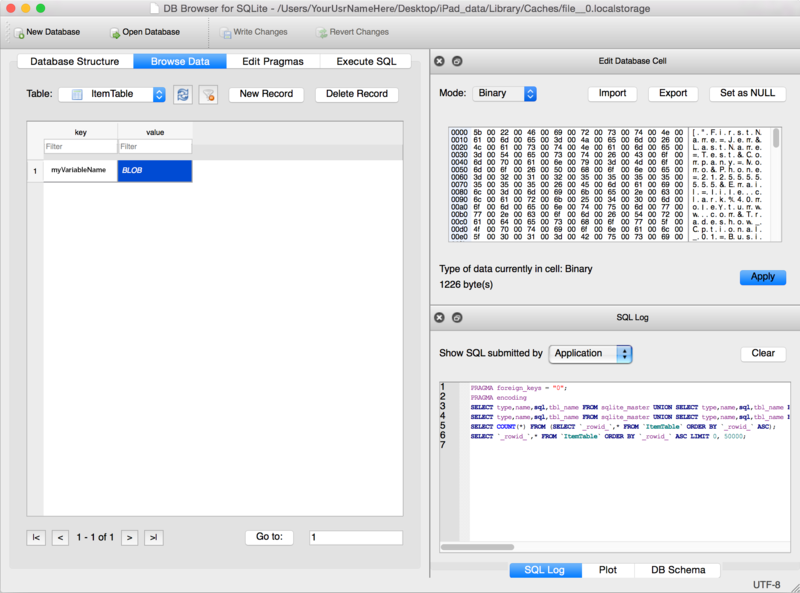 Install DB Browser for SQLite on your Mac. Under the hood, cordova saves your localStorage data as a simple SQLite database. Go to Apps in the main nav on the left. 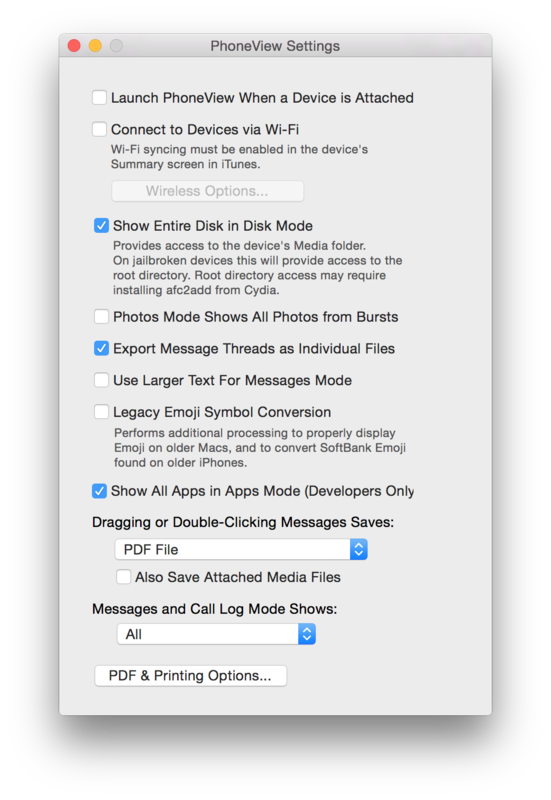 Check the “Show Entire Disk in Disk Mode” and “Show All Apps in Apps Mode (Developers Only)” boxes. You’ll get a warning confirmation popup, which you should accept by clicking OK. The folders you want is yourApp/Library/Caches/ and yourApp/Documents/Backups/. The file should be called something like “file__0.localstorage” in /Library/Caches or “localstorage.appdata.db” in /Documents/Backups. It’s essentially a SQLite file, and can be opened using an app that lets you view SQLite files. To open it, you need to first copy the Library folder to your Mac. Choose a location to save it on your machine. Save your file as .txt and open the .txt in any text editor, like SublimeText, to access your data as plain text. This entry was posted in cordova, debug, iOS, localStorage, osx, PhoneGap, sqlite and tagged cordova. Bookmark the permalink.